In this Elseworlds tale, the shining city of Metropolis is run by steam-machines, the greatest of which is called Moloch. These machines are maintained by a large worker caste of citizens that are overworked and underpaid. The city is ruled by Jon-Kent, the Master Over Metropolis, who shares his wealth and power with an elite few, including his son Clarc Kent-Son. Unbeknownst to all, Jon-Kent is being controlled by the mad scientist, Lutor, who is now half-machine after an unfortunate accident. Now, Lois is inspiring the working class with hope of a Super-Man who will unite the ruling class with the workers. Her words have reached Clarc Kent-Son and he’s even joined the worker caste, to experience their hardships for himself. But, when Lutor hears of this, he unveils Futura – the first in a planned line of robots that will replace the workers – never tiring and needing no economic reward. She is sent, disguised as Lois, to crush the hopes of the citizens. Clarc Kent-Son sees through the ruse and, with his newly discovered powers and heritage, sets out to take down the mad scientist and make the city a better place for all of its citizens. I’ve never seen Fritz Lang’s Metropolis but, I know enough about it to understand that this is a clear homage of the film. It utilizes the film’s framework and inserts Superman and his supporting cast into the story. It’s an interesting story about the haves and the havenots that doesn’t end with the havenots overthrowing/killing/ruling over the haves. It ends with mediation being the end goal – cooperation, instead of just turning the tables. I dig that twist and I also greatly appreciate Ted McKeever‘s unique art. 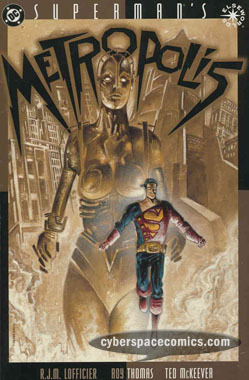 I’ve been a fan of his ever since I discovered his creator-owned series Metropol in my Local Comic Shop’s back-issue bins. Now, I know his art isn’t made for everyone but, it seems to me that a Superman story might be the perfect place to introduce it to a mainstream audience. So give it a whirl: unique art, Superman and an homage for a classic film that exposes the darker sides of Capitalism.